Either a solid or notched beam (usually a 2” x 4”) used to support the top and bottom deck boards. 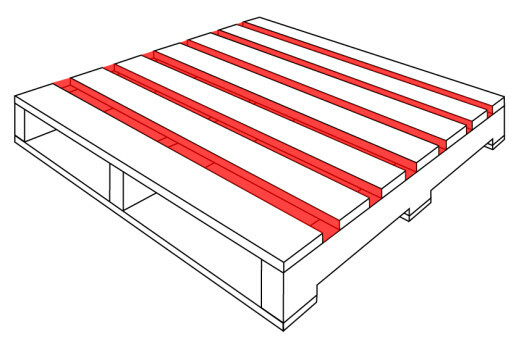 Depending upon need a pallet can have from 2 up to 5 stringers per pallet. 4way – notched opening (cut outs) will accommodate fork tines on four sides of pallet. 2way – accepts fork lift or pallet jack at two ends only. There is no notch. Multiple boards placed perpendicular to stringer forming both the top and bottom of the pallet and sometimes the top only. Boards at either end of the deck. Usually when leads are referred to they are wider than the inner boards for increasing structurally integrity. They will usually be 5.5 “wide and known as 6” lead boards. Boards in between lead boards. Spacing requirements will usually dictate the number of inner boards used. On average, the width of an inner board is usually 3.5”. The spacing between the deck boards. 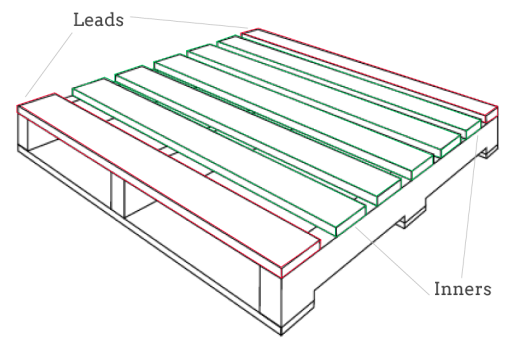 Space is most critical part of the top decking It’s usually dictated by the need to increase total weight across the entire surface or to accommodate the size or shape of the load so that product cannot tip or fall into the spacing. Lighter weight product with large foot prints can sometimes use fewer boards, thus saving money.